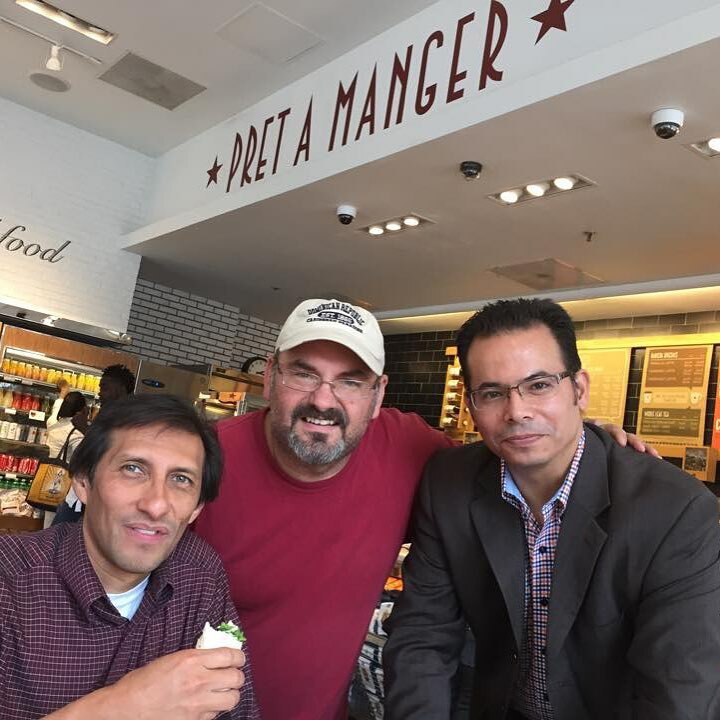 Henry Juarez, Pastor Tim Madding, & Pastor Jose Cortes Jr. This past Thursday, I took the Metro from Silver Spring to Washington DC., together with two colleagues. Our purpose was to visit with a homeless man. Just as we walked out of the Gallery Place – Chinatown Metro Station, we could see the homeless. What a contrast! Just a few blocks away from the residences and halls of power, right by the steps of historical monuments, the very same streets which are regularly transited by the most influential and powerful in the world, are also the home to thousands who have nothing. According to a report by the Washington Post, there are over 11,000 homeless men, women, and children on the streets of the Washington Metropolitan area.We walked the streets, as we looked for the homeless man, actually we were looking for a Homeless Pastor. Yes, Tim Madding, the Lead Pastor of the almost 1,000 member Beltsville Seventh-day Adventist Church, was homeless on the streets of DC, he had actually been homeless for six days, and we wanted to see him, pray with him, encourage him, and perhaps feed him. I am sure that by now, you are asking: Why was the Senior Pastor of such a large Adventist church homeless? Doesn’t the Potomac Conference pay its Pastors enough that they have to go live in the streets? Pastor Tim Madding was homeless on the streets of Washington DC because he made the decision that together with his church they needed to take Jesus’ lifestyle and message of compassion, hope, and wholeness to the next level. Although the Beltsville Seventh-day Adventist Church is already well known in the area for its Community Services programs and initiatives, this Pastor and his church have decided they can do more. For seven weeks, Pastor Tim will highlight some of the greatest needs in his church’s neighborhood and across the world through a sermon series entitled “Seven Days Without”. After each sermon he has pledged to spend seven days living out the very need highlighted in his sermon. Not only will he preach about it, but he will also live it for the next seven days. The purpose of the “Seven Days Without” series goes beyond creating awareness in his congregation and in the community. The main objective is to find ways for every member in the church to become the Eyes, Heart, Hands, and Feet of Jesus. As we’ve said before, you may not be able to preach or teach, but you can love, you can reach. Jesus did! 1. Mingle with people you would like to reach. The incarnation ministry of Jesus on this earth is perhaps the greatest example; the Gospels are clear that He came and dwelt among us. There is much that can be done from a Pastoral Office and from within the four walls of the church building, but nothing will ever replace the value of hanging out, talking, walking, and eating with the people you want to bless and reach. Jesus did. 2. Look at people’s eyes and address them, even if you have nothing else to offer. As we walked the streets in DC, we noticed that as homeless men and women extended their hands asking for money, most people will pass by and totally ignore them, as if they were not even there. Being invisible can be more hurtful than being penniless. Pastor Tim taught me something, he said: “Jose, even if you have nothing to give, make eye contact and say hello… they appreciate that.” I tried it and I saw a spark in their eyes, smiles on some faces, and heard grateful words of someone who stopped being invisible for a brief moment. Can you imagine what it would be like, if we made people everywhere feel visible and appreciated all the time? Jesus did. 3. Support and Partner with Others who are willing to help. As our time together with Pastor Tim came to an end, we asked him, if we could get him something to eat. He accepted, realizing that he did not know what they would serve in the shelter later that night, and added, “If we eat, we have to go to a place of my choice.” He was the homeless, we were not, “by all means Tim, anything you say…” Pastor Tim took us to PRET A MANGER, a sandwich and soup place that donates all their unsold food to local charities at the end of each day. In 2014 they donated over 500,000 meals to people in need. There are other people who you could support and partner with as you bless others, Jesus did. Remember the boy with the bread and fish? He had something Jesus could use, while Jesus had something the boy did not have. Together, they fed a lot of hungry people. Think about it, which individuals and businesses in your community, and around your church, can you support and partner with, as you reach your community with compassion? I couldn’t tell which one was the homeless person in the picture.